Fall is a great time to go canoeing; the bugs are gone, and the colors are out. It also is a time for sensible precautions. Fall temperatures often are cold, and that can be a hazard, even on sunny days. I was reminded of that a few weeks ago when I joined the Wooden Canoe Heritage Association for a day on the AuSable River. It wasn’t a hard route, and the group was mostly middle-aged paddlers with experience. And yet, one older couple made a classic mistake. They came around a bend where a sizeable log jam extended out into the river. With little time to respond, the husband reached up to grab an overhanging branch to stop their progress. What happened was predictable. He stopped, but the canoe did not; it rolled upstream and dumped them both into cold spring-fed water. The man is 78 years old. He has a pacemaker. His wife worried terribly about his well-being. Never once — until now. Fortunately, both were wearing lifejackets. He was closer to shore, but both were carried into the sweeper, where their capsized canoe was only lightly pinned by the water pressure. And yet, it was a treacherous and unpredictable moment. Either could be drawn under if they were not careful. I looked on from directly across the river, swiftly weighed the options and prepared to go in, if need be. But what I really wanted was the rescue throw-rope I normally carry in my canoe. I wasn’t certain the woman had the strength to hand-over-hand her way back into shore. It was a readily throwable distance if her strength failed. But I hadn’t packed it — an oversight. 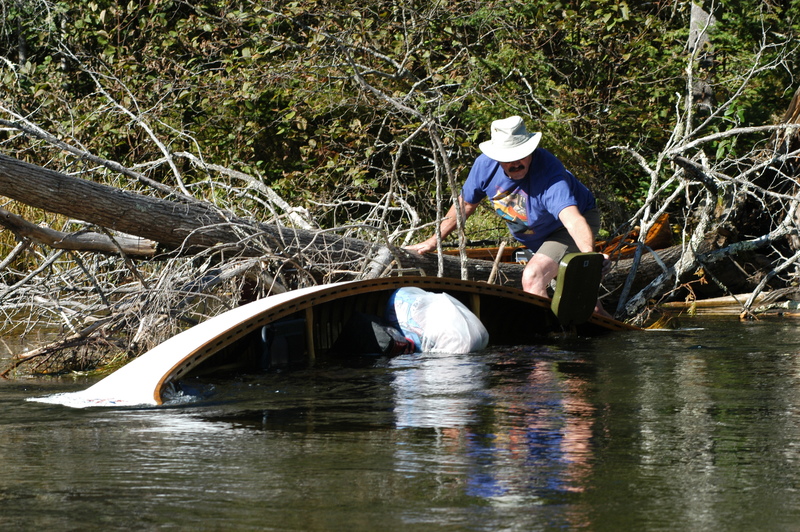 An easy four-hour float on the AuSable in big wooden canoes hardly seemed to merit one. I was wrong. Fortunately, the couple was able to work their way to shore. Friends quickly arrived on the scene and worked to extract the boat and get them dry and changed. What if they had been alone, I wondered, and was reminded of two others: Two men on a fall paddle in a canoe-camping course I taught years ago, had tipped on a miserable cold, day while floating the Manistee River. They had done much the same: grabbed an overhanging branch. There was no killer sweeper, just a branch too low to negotiate without getting low in the canoe. They swam after their gear as it floated away. Neither had followed instructions. They had flimsy plastic bags rather than sturdy, waterproof dry bags. Nothing was secured to the canoe. Their gear bags just floated downstream, taking on water soaking their sleeping bags, tent and clothes. Fortunately for them, it was the last day of the trip. Both would otherwise have had a long and miserable night. extras I usually carry, things that friends sometimes tease me about as overkill. I had no throw rope and there were no painters on the borrowed canoe. I had no way to fashion a tether to tow another boat or even to tie mine up. My dry bag held clothes, rain gear, compass, food, water, fire-making materials, a thermal-blanket, first-aid kit and even a head-lamp, just in case. My river knife, to cut rope or tangles, lives on my lifejacket. You never know what can happen even in seemingly benign situations. Sadly, the next weekend, I read a tragic account of a 50-something Minnesota couple who perished while canoeing on one of their favorite lakes in the Boundary Waters Canoe Area Wilderness. Their son reported to authorities that they were very experienced paddlers who ventured out for several weeks at a time, several times a year. The Twin-Cities Pioneer Press printed a heartbreaking photo of the couple kissing. Both were wearing lifejackets, according to authorities. It had been windy, gusty and unseasonably cold. The water temperature was 50 degrees. Hypothermia was the suspected cause of death. Experts say unconsciousness or exhaustion sets in after 30 to 60 minutes, and survival time is one to three hours. No one saw it or knows how it happened. They were alone. Their bodies were found floating the next day. Authorities found their campsite “buttoned up, with good gear and everything seemed to be in order,” according to the story. In essence, they were out for a pleasure paddle. The lesson remains important no matter how old or experienced you are. Fall may be a great time to paddle, but it an important time to go prepared. © 2012 MLive.com. All rights reserved. This entry was posted in Uncategorized and tagged AuSable River, Boundary Water Canoe Area Wilderness, Canoeing, Hypothermia, Manistee River, Paddling, Wooden Canoe Heritage Association. Bookmark the permalink.